One of my goals for 2015 is to develop more motivational material for Fat X 101 so as to help motivate and re-motivate Fat X 101 followers (FX’ers). I’ve found that having fun with fitness improve and enhances motivation. So with that being said, I’ve developed the 100 City Push Ups movement which we’ll spread on social media through the the hashtag #100CityPushups. The 100 City Push Ups movement will be an opportunity to motivate or re-motivate yourself and others by going outdoors, showcasing your city, and getting in some extra exercise. Check out the video, help me spread the word, and let’s have some fun with it! The good news is that obesity can be prevented and or reversed. Starting and or continuing a health and fitness journey will help prevent and or reverse obesity and it’s related illnesses. One of the main concepts I want to convey to people through Fat X 101 is that you don’t need fancy or expensive fitness equipment to start and or to continue on a lifelong health and fitness journey. What you do need to start or continue on this health and fitness journey is MOTIVATION! Igniting and continuously fueling that motivation is highly important. That’s what this 100 City Push Ups movement is all about! I’ve chosen the push up exercise for this fitness motivational movement because it’s a perfect example of an exercise that is extremely beneficial and requires no equipment at all. You can do the push up exercise virtually anywhere, and at anytime. For the more advanced, push ups and it’s more difficult variations can become a useful tool for any type of workout program from strength and muscle building to fat burning and endurance training. It’s an exercise that anyone and everyone can do in one form or another. For the 100 City Push Ups movement, feel free to get creative, take a photo, post it on Instagram and hashtag it (#100CityPushUps)! Complete 100 City Push Ups during the week, either all in one shot, or spread them out. 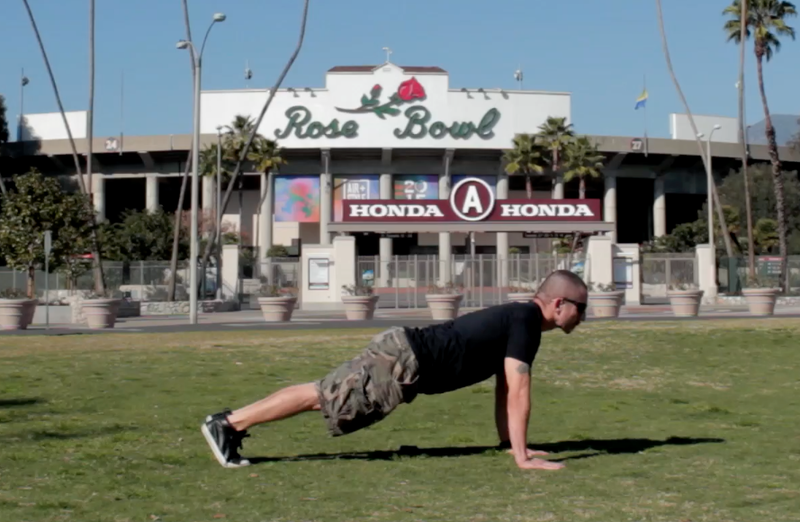 As long as you’re completing 100 push ups around your city every week, you are part of the #100CityPushUps movement. If you’re already highly motivated and you’re deep into your fitness journey, join the 100 Push Ups movement and help motivate others. . If you’re just starting on your fitness journey, join the 100 Push Ups movement and follow others to help your motivation. I’ll be featuring some of the best hash tagged Instagram photos here, and, at the end of March, I’ll repost the best one to my Instagram account, and award that person a Pro Source Ultra Deluxe Foam Roller. As always, if you have a fitness related question (workout, diet, exercise etc.) feel free to contact me. If you’re in the Pasadena area and you’re interested in one on one fitness coaching (personal training) or, you would like to join one of my small group FX Boot Camp Classes, contact me ASAP, and let’s get you started. Be ready for some great workouts!